A pave engagement ring setting appears as if it has been paved with beautiful diamonds. It is a French term and pronounced “pah-vey”. Encrusted with small diamonds, it gives the appearance of a diamond surface versus a metal one. These small diamonds normally have 58 facets that give the setting its distinctive sparkle. This intricate design makes the diamonds appear larger than they are. It is truly a captivating design. Pave settings are unique in that they incorporate small prongs or beads to hold each stone. Most pave settings are platinum or white gold. Pave settings are very popular due to their elegance. Generally, a pave setting has a large center stone located above the encrusted diamonds. The jeweler uses a princess or round cut diamond and sets it with prongs. If you wish to highlight the stone, consider a bezel setting. Simple design with a center stone: This design is thin and features a single row of diamonds. Since the width of the diamonds match the width of the band, it appears to be only diamonds. There is a large center stone on the band. Simple design without a center stone: Same features as above, simply no center stone. These settings are very popular as anniversary rings, but work quite well for engagement rings also. Wide three-dimensional design: This beautiful setting has the familiar single row of diamonds with a large center diamond. It also has additional angled rows creating the illusion of a curve. All of these designs can be set in a full or half-pave. The full pave has the small diamonds around the complete setting while the half-pave setting has diamonds on the top portion only. Some have said that even though the full pave is brilliant, the half pave is more comfortable to wear. A micro pave setting uses very small diamonds. Because of their size, it is very difficult to distinguish one from another. Setting these small stones takes very precise work and they can be less secure. A micro pave is very stunning because of the number of diamonds used and may be an excellent choice for you. Since the diamonds on the pave setting are exposed, you must take extra care when wearing and cleaning it. Remove your ring when you exercise or while doing any physical activity. If you are using cleaners or harsh chemicals, remove your ring. Since it has more nooks and crevices than a normal setting, it will require cleaning more frequently. Soaking your setting will help dissolve the dust and dirt. Diluted dish soap works well. Never scrub your setting with a brush. Be very careful when cleaning it so the diamonds don’t loosen. Since indentations in the band hold the diamonds, occasionally one will fall out. Have your jeweler do inspections regularly. They can detect any loose diamonds and reset them so they do not fall out of the setting. If a stone is lost, do not be alarmed. Replacements are inexpensive and any jeweler can replace lost diamonds quickly. Do not wear multiple pave rings. The diamonds will rub together, damaging the settings. You can pair them with plain bands if you wish. On the other hand, you can buy an integrated pave ring set. As with any engagement ring, a pave setting can be very reasonable or very expensive. You would think that a ring with so any diamonds would automatically be costly, but the truth is that since smaller diamonds do not need to be of high quality to be brilliant, then your pave setting can be very affordable. If you are on a tight budget, you have some less expensive options. For example, a setting with no center stone or one with a colored gemstone will decrease your ring’s price considerably. Another option is to use imitation diamonds rather than the real thing. The cost of your ring depends on the total carat weight of the diamonds used and the type of metal used in the setting. If your ring has a filigree pattern. If it is designer made or is a custom ring. 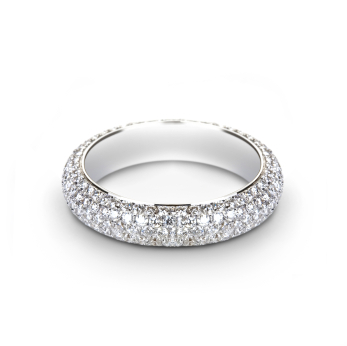 When you consider that a pave band is covered in diamonds, you soon realize that the setting will be difficult to resize. When you make your selection, be sure to have an accurate sizing done before it is ordered. When you purchase your pave setting, do so through a reputable jeweler. You will need your new ring inspected at regular intervals and you will want to choose a jeweler that offers service after the sale. Pave setting engagement rings are very enchanting and have become a favorite choice for couples. Even though they need extra care, they can be mesmerizing and a perfect choice to symbolize lasting love.